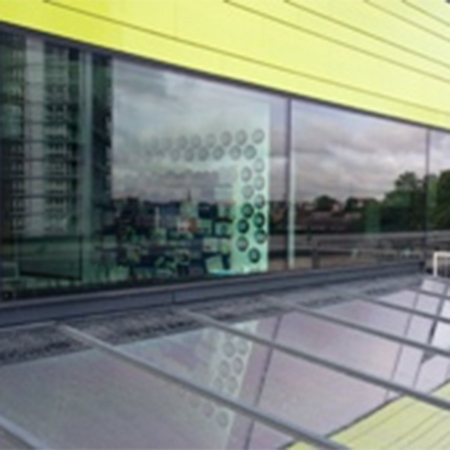 UK Window Films has installed its Stainless Steel 25 OSW external film at a state of the art Academy in London. The typical window blinds installed were breaking from misuse and required regular expensive maintenance or replacement. UK Window Films were asked to provide a long term solution to their problem. Stainless Steel 25 OSW is an excellent hard wearing external film that reduces high amounts of solar heat gain and glare from the sun, offering huge energy saving benefits in one application. With the Total Solar Energy Reduction at 72%, room temperatures are lowered providing a safe and comfortable workplace and saving energy costs. An added bonus is the film will reduce UV light by 99%, protecting students from skin damage and valuable fabrics and furnishings from fading. Once installed this film gives a subtle low reflective neutral charcoal finish. With a specialist scratch resistant coating and external protective UV coatings our Warranty for installing on vertical glass is for 7 Years.